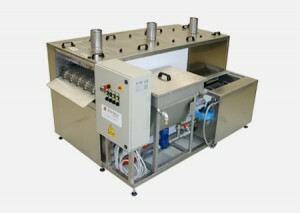 In Syntech carpet washing systems, the parts to be treated are arranged on a horizontal conveyor, which, moving at constant speed, subjects them to the washing action, obtained by means of high pressure nozzles. 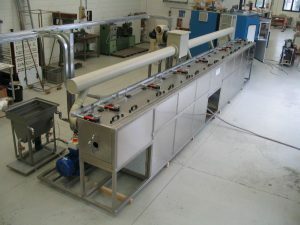 In the lower area of the plant, under the washing and rinsing stations, are the accumulation and collection tanks for the process water that are sent back to the spraying ramps, through high-prevalence pumps. If necessary, dripping areas are inserted in such a way as to contain entrainment of liquids between one tank and the other. To speed up the final drying phase with hot air, a high prevalence blowing unit is used to remove the water from the parts.